The good folks at Google like to keep us guessing don’t they? 2012 alone saw dozens of changes and updates to the mysterious Google algorithm, causing quite a stir among expert internet marketers and everyday business owners alike. While Google claimed that most updates would affect only a small number of sites, lots of businesses felt the pinch and some were crushed altogether. Even if you’re a novice to internet marketing and search engine optimization, you can likely see a trend in the graph below that doesn’t look too promising. This traffic report is real data from a client of mine who had received a rather severe drop in traffic after a Google algorithm update in 2011. Their traffic has never recovered…until now. So how does one recover from these arcane Google changes that have shaken up the internet? Let’s quickly first diagnose the problem. There are two main animals to blame for these dramatic drops in website traffic: Google updates named after a penguin and a panda. If you’re not familiar with these changes, there are a few basic facts worth becoming acquainted with. You don’t need to confess your sins to me, but for those of you guilty of any of the above; how can you get your website out of the doghouse with Google? 1. When did you first notice a drop in website traffic? Try to identify which Google update is responsible for changes in traffic trends. 2. Does your site have high quality content that’s unique? Run a quick search in Copyscape to make sure that your website copy isn’t being used on other websites. 3. Was your website involved in a shady link building scheme? 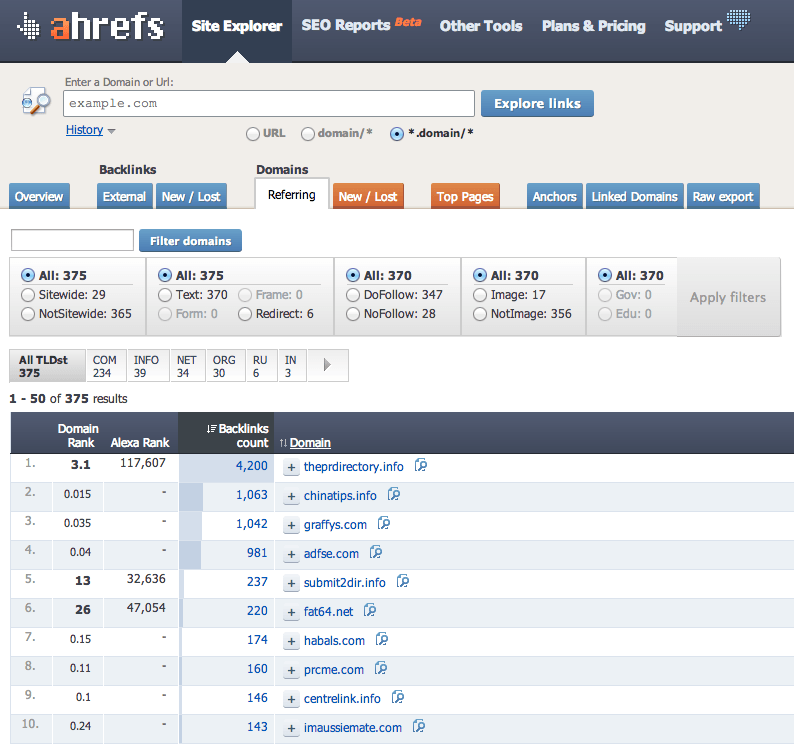 Take a peek at how many links you’re receiving from a single website by using a site like Ahrefs.com. If you’re receiving hundreds of links from a single website like the example below, this could be a red flag. Now that you’ve better identified the problems hurting your standings with Google, take action! Easier said than done, right? If you can’t reach the owners of a website to remove the spammy links they have pointing to your site, (like the 1,063 links coming from chinatips.info above) then consider submitting a disavow request to Google. Google Disavow is a new option that allows site owners to let Google know which external links they’d like Google to ignore. You’ll first need to make sure your website has been set up with Google Webmaster Tools. Next, follow Google’s prompts to create a .txt document listing each of the spammy links that you weren’t able to get removed. Last, upload the file and start praying! You can see from the example above that my client is now receiving a huge spike in traffic since updating his site with unique content and disavowing a host of spammy backlinks. We’ve actually seen nearly 500% increase in visits since making these changes, compared to the previous month’s traffic. Your results may not be as dramatic, but building a website with quality content and promoting it the right way will ultimately keep you out of trouble with Google and other search engines. Is there life after Panda & Penguin, you bet! Improve the health of your website and start bringing back high quality traffic that will generate leads for your business! Foodie, locavore, wannabe travel show host and inbound marketing enthusiast.